Jerick McKinnon offers a touching tribute to the late gorilla. October is the month football players are using their footwear to make strong statements for some of the biggest causes. Minnesota Vikings running back Jerick McKinnon continues to the trend with his cleated tribute to a beloved gorilla. Harambe, a 17-year old Western lowland gorilla, was tragically gunned down after a young boy fell into his enclosure at the Cincinnati Zoo earlier this year. 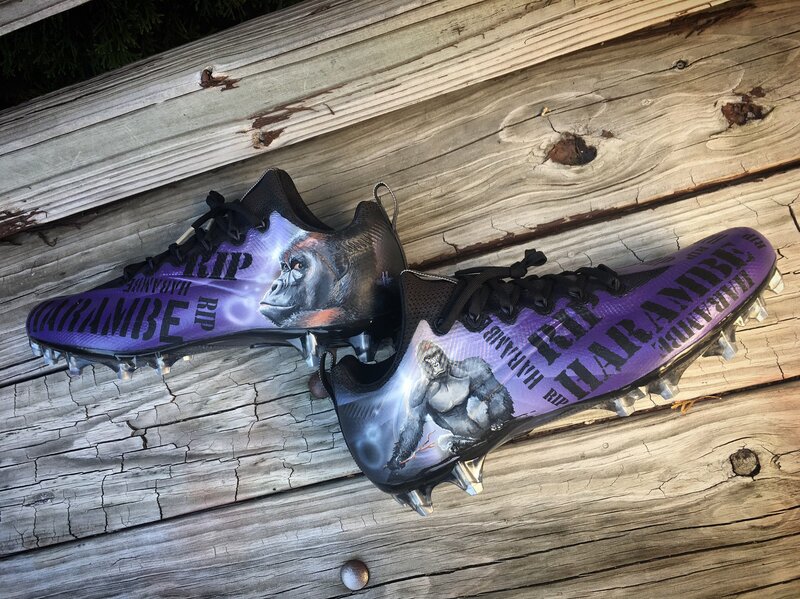 Though gone, the spirit of Harambe has continued to live on through the internet — and now McKinnon's custom Nike cleats by Mache. The custom cleats, styled in Vikings purple, feature varying Harambe graphics, along with "RIP Harambe" lettering along the sides. We'll see if McKinnon is actually allowed to wear the cleats in-game when the Vikings visit the Philadelphia Eagles at 1:00 p.m. EST.